sultana | What's for tea tonight dear? Last Sunday was apparently ‘stir up Sunday’, the last Sunday before Advent when traditionally we’d begin preparing puddings for Christmas. However the Shopkeeper and I had been entertaining until the early hours and when I caught sight of myself in the bathroom mirror that morning the idea of taking some wrinkled old fruits and soaking them in booze was just a touch too ironic to contemplate. Not to worry, there is still time to prepare your puddings. It’s really not difficult, and so much more satisfying than opening a shop bought box on Christmas day. I base mine on a recipe I first picked up in Waitrose nearly ten years ago but I’ve tinkered with and tweaked it over the years. Unlike the precise science of cake baking, puddings are very forgiving of changes so you don’t need to agonise or work with milligram precision. Last year I realised two hours into the steaming time that I’d forgotten the flour altogether, and the puddings were none the worse for it. My main changes have been to reduce the amount of sugar and flour, and to up the fruit and booze content – I really can’t imagine making a Christmas pudding with only two tablespoons of brandy! I also try to find an interesting mix of fruits to add to the basic raisins and sultanas. For instance this year we have some ‘Persian Delights’ dried fruit mixes in the shop which include pineapple, papaya and mango, so a packet of these has joined the other fruits in their brandy, orange juice and spice bath. And I have to have halved glacé cherries! They were always there in my childhood Christmas puddings, feel free to add any childhood memories of your own. These quantities will make two 1.5 litre puddings, each big enough for eight people with some to spare [no harm in having a spare, and they make great gifts]. If you only want one, halve these quantities but the cooking time will be the same. You can also make small individual puddings which will take just two hours to steam. 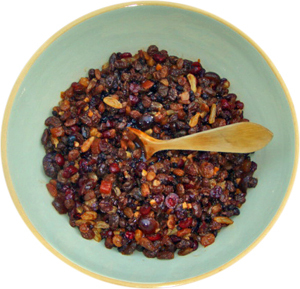 1.2 kg dried fruits, including 350 g each of raisins and sultanas, the rest made up of a mixture of whatever takes your fancy from cranberries, apricots, cherries [dried or glacé], blueberries, candied peel, etc. The more the merrier! 1 silver coin, any currency or denomination! Start by mixing the dried fruits with the orange juice and zest, spices, stout and brandy [and toffee vodka if using]. Leave to soak for a couple of days, stirring from time to time. Mine is doing this now [on top of the washing machine to make best use of the vibrations] and every stir fills the kitchen with the smell of Christmas. When I’m ready to cook this tomorrow I’ll add all the other ingredients and mix well. Traditionally everyone in the house should stir the mix whilst making a wish, and I might even invite a few of the neighbours to have a go just to make sure. Grease the pudding basins [1.5 litre capacity] and fill them to a couple of centimetres below the rim, tapping and pushing down well to make sure there are no gaps or air bubbles. The only really fiddly bit is sealing the basins for steaming, and if you really can’t be bothered then you can buy plastic versions with clip on lids. Otherwise for each basin cut two large squares of greaseproof paper and one of foil and stack them with the foil on top. Fold once near the middle, and then back again about two centimetres away to make a pleat. Cover the top of the basin with your pleated sheets and tie around with string. It will help if you can loop through another piece of string to make a handle, but this is easier with four hands so enrol a helper. You let your neighbour make a wish didn’t you? Well it’s payback time. Place each sealed basin onto a trivet [an upturned heat-proof plate will do] in a pan and carefully pour in boiling water to around half way up the basin’s sides. Cover the pan, and once simmering steam the puddings for six hours. Check the water from time to time and top up as necessary. Six whole hours when you can’t leave them entirely alone but they will require little of your attention – time to do some online Christmas shopping perhaps, or to write your cards? Once they’re done allow the puddings to cool, remove the foil etc., wipe the bowls clean and decide whether you plan to reheat them by steaming again or in the microwave. If the former then repeat the wrapping process described above. If you’re microwaving then simply cover well with two or three layers of clingfilm. Place the puddings somewhere cool and dark [I wrap them in plastic bags too] and forget about them until Christmas morning. Come the big day heat your pudding by steaming for two hours, or give it six minutes on full power in an 850 watt microwave. 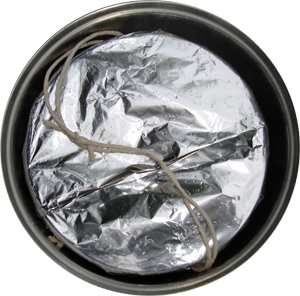 Wrap your silver coin in foil [easier to find, less easy to swallow by accident, and cleaner] and make a slit in the base of the pudding to insert it. Ease the pudding from its bowl onto a plate, warm a ladleful of brandy, pour over and set alight. I can never resist a sprig of holly too.